Hot spots on dogs (also known as canine acute moist dermatitis) are bacterial skin infections caused by irritation. Hot spots usually occur on the paw, limbs, hip, chest or ears but can develop almost anywhere on the body. Hot spot related bacterial infections arise initially as a result of biting or scratching at a site of irritation. This irritation could be the result of a number of causes (listed below). The irritated area quickly becomes inflamed and itchy. If left untreated a hot spot can develop rapidly becoming relatively large. A hot spot can grow from a coin sized sore to a human-fist sized, inflamed swelling in less than a day. The dog will continue to chew, lick and scratch the affected area, worsening the condition. This creates a favourable environment for bacterial infection. As the infection progresses, oozing sores and crusty scabs, typical of hot spots on dogs, begin to develop. See Dog Health Problems Online for more information about the different types of canine pyoderma. Hot spots on dogs are fairly easy to recognise. They appear as inflamed, itchy areas of skin that will probably be quite painful. Hot spots can develop in a matter of hours and increase rapidly in size. 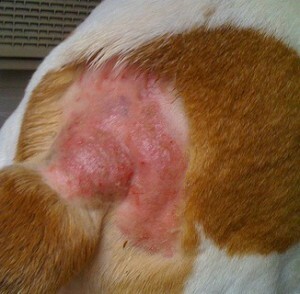 See right for an example of a hot spot on a dog (with hair loss) – Image courtesy of Jay Allen. You may also notice some behavioural changes – your dog may obsess over the affected area, continually chewing and licking it. 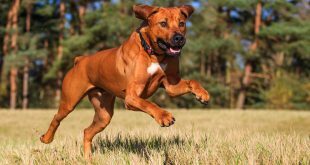 It is not uncommon for dogs to become more aggressive as a result of the pain associated with hot spots. Hot spots on dogs are caused by an imbalance of the natural bacteria that live on their skin. 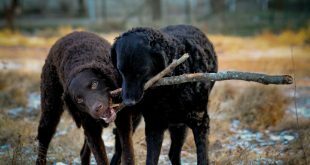 An imbalance can occur when bacteria such as Staphylococcus intermedius (found commonly in your dog’s nostrils and mouth) rapidly multiply in the hair follicles, causing infection. This is known as an opportunistic bacterial infection. Hot spots begin to develop following an initial irritation to the skin that causes the dog to bite or scratch at the site of irritation. This creates hospitable conditions for opportunistic bacteria to flourish. The action of biting and scratching also helps to transfer bacteria to the site of irritation. As the bacteria begin to multiply, the affected area becomes itchier and inflamed. This in turn leads to more biting and scratching, creating a cycle. Bacteria thrive in warm, moist environments, which is why hot spots are more common in warmer months. It is also why an inflamed area that is licked and chewed creates a perfect environment for hot spot-causing bacteria to flourish. There are essentially two steps to treating hot spots on dogs. Firstly, the bacterial infection must be tackled, but the underlying cause of the infection must also be addressed. For example, if the hot spot developed as a result of irritation caused by a food allergy, feeding a hypoallergenic diet might be a good idea. To treat the bacterial infection it is recommended that you visit your local veterinarian. This is due to the pain caused by the hot spot, which can cause aggression. This makes sedation necessary for initial treatment and examination. Clipping the affected area to allow ventilation, making the area less hospitable for bacteria. Cleaning the area with a topical antiseptic such as a Povidone-Iodine solution. Antibiotics, either topical or oral depending on the severity and spread of the infection. Antibiotic treatment can last around 4 weeks or more. Antihistamines may be prescribed in some cases to reduce itchiness. NSAIDs or Corticosteroids to reduce inflammation. Medicated shampoo, used once or twice a week to help keep the skin and coat clean and healthy. An Elizabethan collar ensures that your dog doesn’t continue to lick or chew the hot spot as the area heals. As mentioned earlier, following the treatment of the bacterial infection, it is important to address any underlying causes. There are cases of hot spots on dogs that are idiopathic (no identifiable cause), but more often that not, something is to blame. 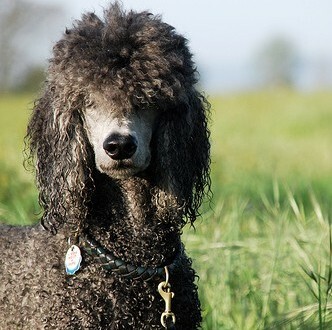 It may simply be that a lack of grooming has allowed the coat to become matted, which is enough to cause hot spots in some dogs. If this is the case, all that is needed is are more frequent trips to the dog groomer. Allergies to food, flea bites or other common environmental triggers (pollen, dust, wool) may also be to blame. Once the cause of an allergy has been determined, steps should be taken to minimise the amount of contact your dog has with the allergy trigger. Another possible underlying cause could be your pet’s behaviour. Boredom, stress or separation anxiety can all be indirectly responsible for the development of hot spots. When bored or stressed, you dog may chew or lick at their paws or limbs, which as mentioned earlier can be responsible for the development of hot spots. If this is the case, you may need to take steps to reduce stress, or boredom. More serious behavioural issues (such as separation anxiety) will likely require the help of a canine behaviourist. Thank you very much for your advice about the tea tree scare. This hot spot issue is what caused me to mistakenly use the tea tree oil. My dog had recently had a course if antibiotics from the vet. I was giving her probiotics to try and keep her balanced but they were 1/3 a dose of human capsules. She had tiny blood clots in her urine after staying with my in laws for a couple of weeks while I was in hospital and was being treated for a bladder infection with penicillin I think. It’s interesting to note that I started giving her the probiotics before we could get an appointment with the vet (about a day and a half) and the clots seemed to be disappearing on their own. Now I am wondering how best to treat this without subjecting her it any more antibiotics or anything toxic. Do you have any recommendations? Also do you have a Facebook page that I could “like” and promote? Or should I just link to your site here? I know that Fungus Free Plus works really good treating hot spots on dogs. Luckly when my dog got hot spots from flea bites it never got as bad as some of the images that I have seen online.